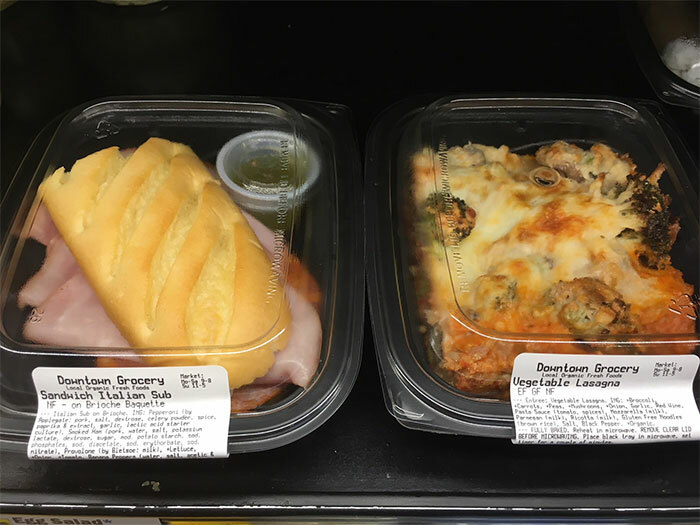 Enjoy Grab & Go selections including lasagna, Italian sub, spring rolls, and wraps. Grab & Go is Open Daily and compliments our self-serve Food Bar. Grab lunch, dinner, and snacks from our cooler case and Go! Choose from sandwiches, wraps, salads, spring rolls, veggie & fruit cups, and heat & serve chilled entrees. Also, choose meal components to add to your dinner at home, such as hummus, dips, pesto, pizza crusts, spiralized & chunked veggies (to add to other dishes), and heat & serve frozen soups & entrees.